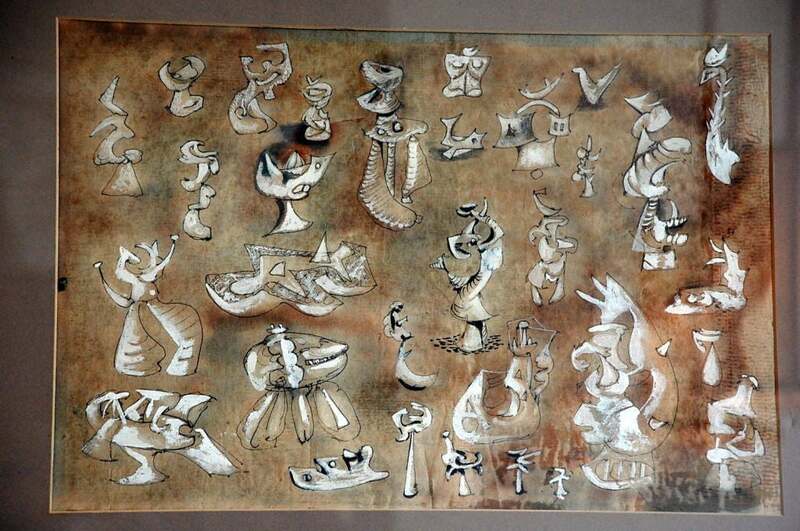 Surrealist gouache drawing by Roberto Matta. 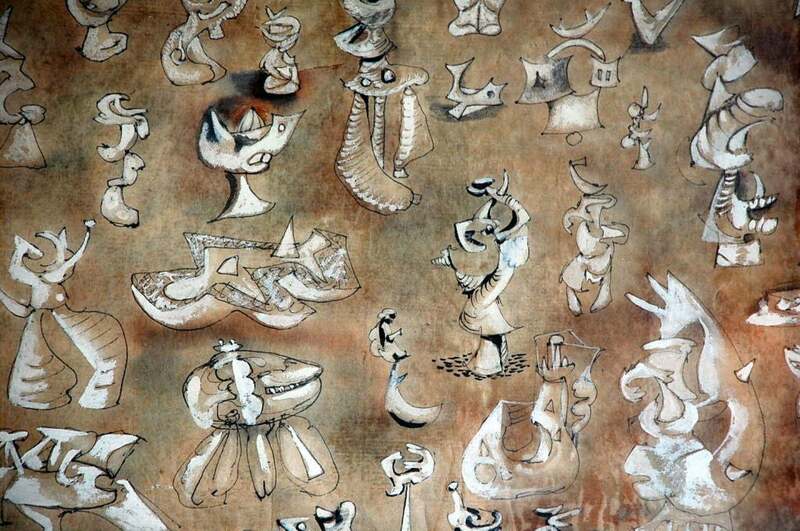 Roberto Sebastián Antonio Matta Echaurren (November 11, 1911-November 23, 2002), better known as Roberto Matta, was one of Chile's best-known painters and a seminal figure in 20th century abstract expressionist and surrealist art. Born in Santiago, he studied architecture and interior design at the Pontificia Universidad Católica de Chile in Santiago and graduated in 1935. That spring, he journeyed from Peru to Panama and completed surreal drawings of many of the geographical features he witnessed. He first encountered Europe while serving in the Merchant Marine after graduating. His travels in Europe and the USA led him to meet artists such as Arshile Gorky, René Magritte, Salvador Dalí, André Breton and Le Corbusier. Matta was of Spanish, Basque and French descent. It was Breton who provided the major spur to the Chilean's direction in art, encouraging his work and introducing him to the leading members of the Paris Surrealist movement. 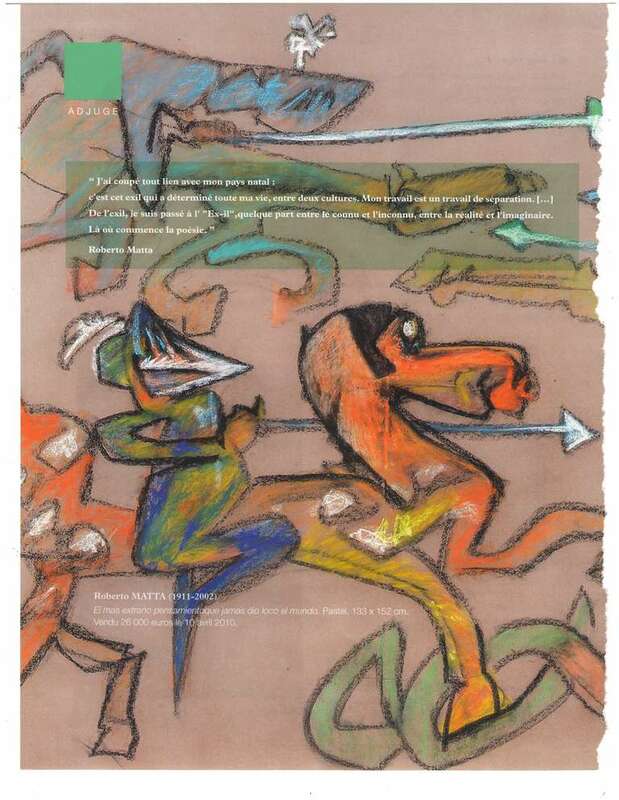 Matta produced illustrations and articles for Surrealist journals such as Minotaure. During this period he was introduced to the work of many prominent contemporary European artists, such as Pablo Picasso and Marcel Duchamp. The first true flowering of Matta's own art came in 1938, when he moved from drawing to the oil painting for which he is best known. 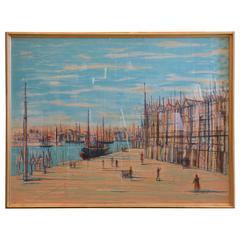 This period coincided with his emigration to the United States, where he lived until 1948. His early paintings, such as Invasion of the Night, give an indication of the work he would continue, with diffuse light patterns and bold lines on a featureless background. This is also the period of the "inscape" series and the closely related "psychological morphologies". Prof. Claude Cernuschi writes, "Matta's key ambition to represent and evoke the human psyche in visual form was filtered through the writings of Freud and the psychoanalytic view of the mind as a three-dimensional space: the 'inscape'." According to the essay on Matta in Crosscurrents of Modernism, the inscapes' evocative forms "are visual analogies for the artist's psyche". During the 1940s and 1950s, the disturbing state of world politics found reflection in Matta's work, with the canvases becoming busy with images of electrical machinery and distressed figures. 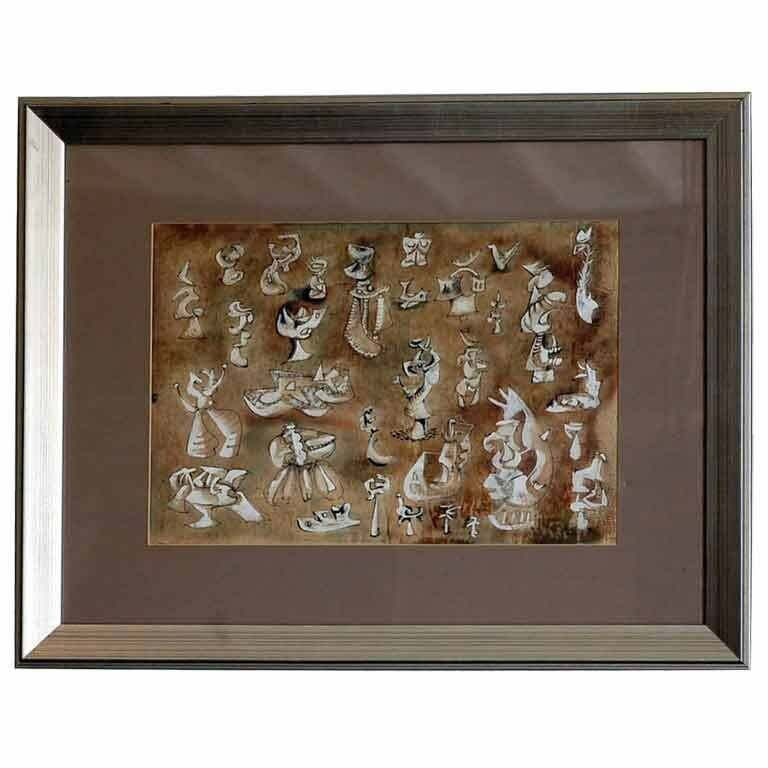 The addition of clay to Matta's paintings in the early 1960s lent an added dimension to the distortions. In his art Matta creates new dimensions in a blend of organic and cosmic lifeforms (see biomorphism). He was one of the first artists to take this abstract leap. 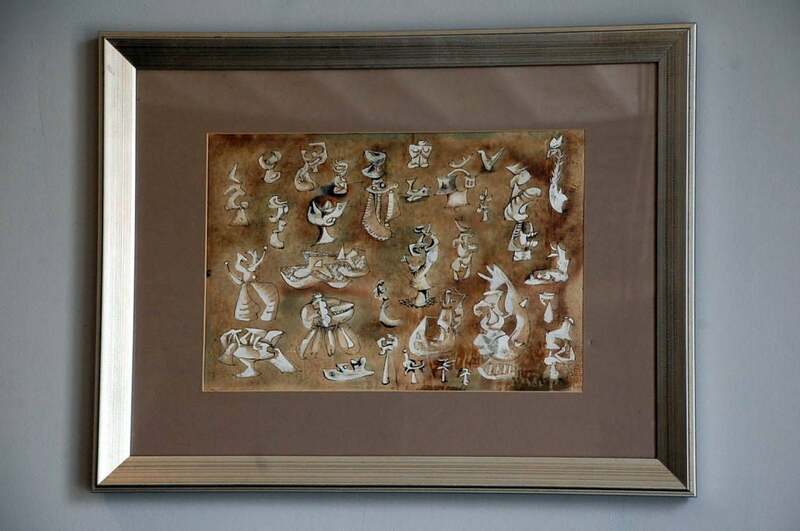 Matta's connections with Breton's surrealist movement were severed following a private disagreement concerning Arshile Gorky and his family. Matta was accused of indirectly causing Gorky's suicide (in response to Matta's relationship with the Armenian-American painter's wife). This led to his expulsion from the group, but by this time Matta's own name was becoming widely known. He divided his life between Europe and South America during the 1950s and 1960s, successfully combining the political and the semi-abstract in epic surreal canvases. Matta believed that art and poetry can change lives, and was very involved in the social movements of the 1960s and 1970s. He was a strong supporter of the socialist government of president Salvador Allende in Chile. Throughout his life, Matta worked with many different types of media, including ceramic, photography and video production. Matta died in Civitavecchia, Italy on 23 November 2002. 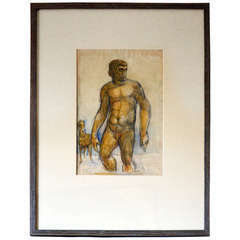 Framed gouache on paper drawing by Jean-Jacques Blot. Signed: "Jean Blot 88". 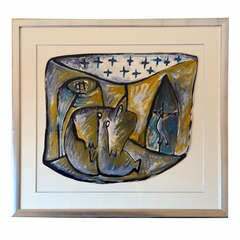 Framed abstract geometric gouache on paper by Stevan Kissel Signed: Stevan Kissel Los Angeles, CA. Beautifully framed. French 40's Gouache on paper. 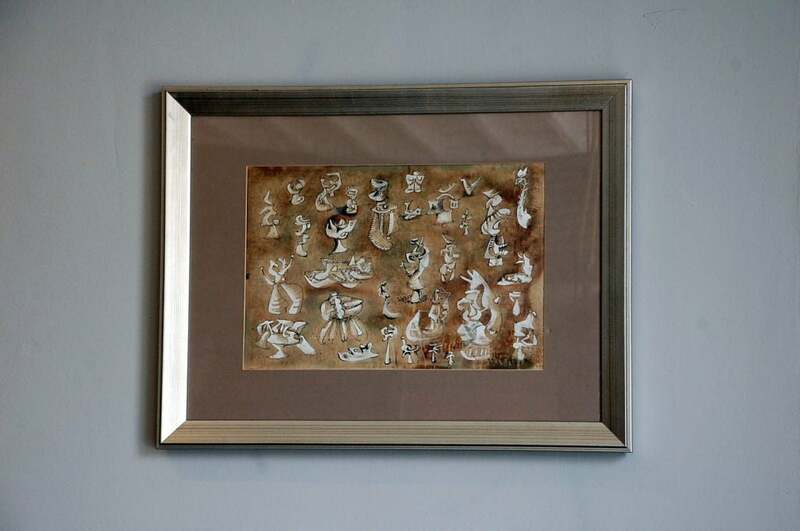 Custom framed with sandblasted oak frame with acid free paper and UV glass. Framed watercolor of a desert landscape with a woman tree and clouds, by artist R. E. Schwelke.